Stab victim, guard, and civilian Gabi Vaknin fire at Gush Etzion Junction attack terrorist. Vaknin describes moments of attack. 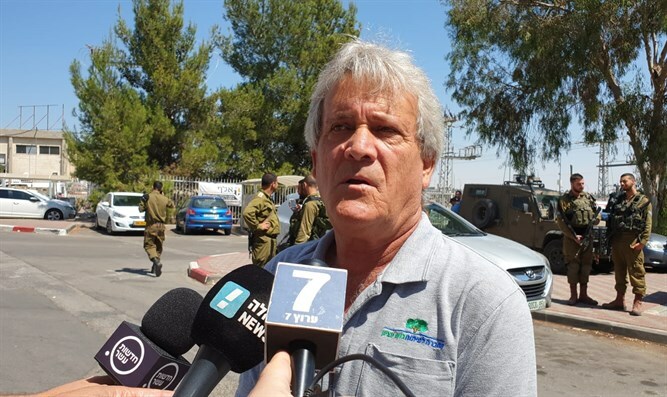 Gabi Vaknin, one of the three civilians on scene at today's stabbing attack in Gush Etzion who shot at the attacker, described the incident: "I looked to the right, saw the stabber, saw the one who was stabbed. The stabbed one yelled, 'terrorist attack, terrorist attack!'. The stabber yelled in Arabic and started running towards the shopping center's entrance. I ran adjacent to them - on the road, not on the sidewalk - got line-of-sight to allow me a clean shot, aimed towards his body mass, and I shot. "Before me, the stabbed man, who also ran after the terrorist, took a shot - even before me, possibly - the security guard also got off a shot, there were three of us shooting. "The incident ended. I removed the knife from the terrorist's hand because I saw he was still dangerous, he still had the capability. I stood next to him, or someone came and stood near him; one of our people stood next to him, and the one who was stabbed I saw collapse after he got off his shot, and I warned others to be careful not to confuse him with a terrorist, that they shouldn't shoot him. Thus the incident ended." Asked by a reporter to reiterate whether the stab victim himself succeeded in firing his weapon, Vaknin affirmed, "The stabbed one did succeed in getting off a shot. He ran after him parallel to me - that I know after the fact, because I saw him over at the edge. My eyes were only looking for where the terrorist ran. Once I saw he was in a corner that allowed me to fire off a shot I shot, I saw him fall, the shooting stopped, and with that the incident finished for me. Of course when he was down I removed the knife from him." Asked how long the entire incident spanned, Vaknin shrugged and answered, "I don't know; the stabbing, running... A few seconds, I don't think we passed a minute, from the moment I identified him. "The one who was stabbed - I was able to say, 'This one was stabbed.' I actually saw him being stabbed, I saw how he was dressed, I saw how he looked. I saw him get over to there, fire off a shot, and collapse between the cars."